Stately and majestic, the Serval with its noble carriage, oversize ears, mile-long legs, and striking, jet-black spots nestled in a lush butternut coat is sheer magic. Once you’ve seen just one Serval, you’ll know why the Savannah was created. No other hybrid can come close to fulfilling the drama and yearning for breathtaking, wild elegance! A Serval / domestic feline cross, the Savannah or Sahara cat is the largest hybrid cat available today. Smaller and more manageable than a Serval, males range from 15 to 30 pounds depending on generation, females from 9 to 17 pounds. However, because of their tall, lanky, attenuated body type, even the lightest weight Savannah appears much larger and heavier than it actually is. 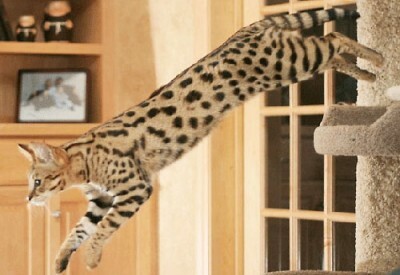 Perhaps, over and above size, is the extraordinary Savannah cat personality. Bright, inventive, intelligent, even ingenious, playful, charming, and intensely energetic, the personable Savannah cat is very dog-like. Readily trainable, most love to play fetch, ride in cars, and relish outdoor walks on a leash. Actually a Savannah can be very much like a water-loving dog who’ll wrestle you for the garden hose, splash around in your morning shower, or wade through your bathwater. And their ability to leap straight up into the air is awesome. Because Savannahs have so much energy they usually tend to tire out other pets, quickly looking for a new playmate or other form of entertainment. Savannahs cohabitate well with other pets and assume the roll of Alpha cat without much of a challenge from other family cats. Many ask if a Savannah cat will get along well with the family dog; the answer is YES! Dogs make wonderful playmates for the Savannah. Because of their intelligence and energy level it seems Savannahs would rather befriend the family dog before other pets. Some owners have reported their Savannah waits at the door for them to arrive home. Some Savannahs have even figured out how to open doors! Once home, Savannahs enjoy being with their owners, usually following them from room to room as they go about their business. 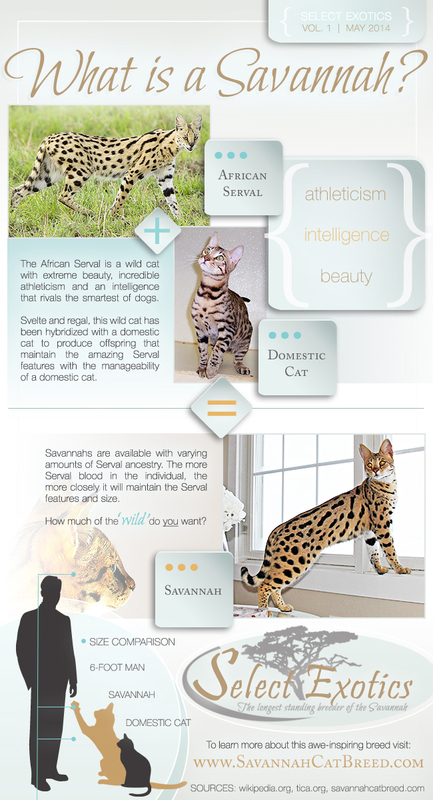 For additional Savannah cat information, read the FAQ’s page. 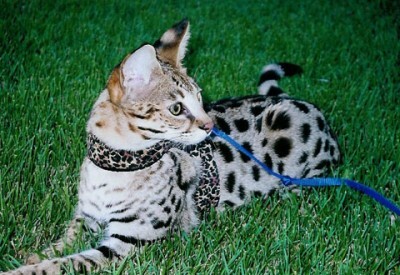 Unlike owning a Serval, no permits are needed to own a Savannah. Savannahs require no special care beyond the care you would give a domestic housecat. Since they don’t require a special diet, we recommend a high quality, dry food. Savannahs use a litter box. And they make ideal house pets, getting along well with other pets and children. While mating a Serval to a domestic cat is the goal of many breeders, only a select few breeders world-wide have been able to achieve success. Savannah Cat Breed was one of the first and is still one of the few who have created a breed resembling the most desired exotic feline, the Serval. Select Exotics has F1, F2, F3, F4, and F5 kittens ranging from 65% to 5% Serval. Sterile until the 4th/5th generations, male Savannahs are available as pets only. Females of all generations are fertile. Most can be purchased as pets or purchased with breeding rights for an additional fee. Achieving extraordinary beauty is not an easy task. You can learn more about the different generations on the Which Cat is Right for You page.